The territory of the Colquhouns is in Dumbartonshire, and the priciple familes of the name are Colquhoun of Colquhoun and Luss, the chief of the clan, a baronet of Scotland and Nova Scotia, created in 1704, and of Great Britain in 1786; Colquhoun of Killermont and Gardcadden; Colquhoun of Ardenconnel; and Colquhoun of Glenmillan. There was likewise Colquhoun of Tilliquhoun, a baronet of Scotland and Nova Scotia (1625), but this family is extinct. The origin of the name is territorial. One tradition deduces the descent of the first possessor from a younger son of the old Earls of Lennox, because of the similarity of their armorial bearings. It is certain that they were anciently vassals of that potent house. The immediate ancestor of the family of Luss was Humphry de Kilpatrick, who in the reign of Alexander II., not later than 1246, obtained from Malcolm, Earl of Lennox, a grant of the lands and barony of Colquhoun, in the parish of Old or West Kilpatrick, pro servitio unius militis, &c., and in consequence assumed the name of Colquhoun, instead of his own. His grandson, Ingelram, third Colquhoun, lived in the reign of Alexander III. His son, Humphry de Colquhoun, is witness in a charter of Malcolm, fifth Earl of Lennox, in favour of Sir John de Luss, between the years 1292-1333. The following remarkable reference to the construction of a house ad opus Culquhanorum, by order of King Robert Bruce, is extracted from the Compotum Constabularii de Cardross, vol i., in the accounts of the Great Chamberlains of Scotland, under date July 1329, as quoted by Mr Tytler in the appendix to the second volume of his History of Scotland: "Item, in construcccione cujusdam domus ad opus Culquhanorum Domini Regis ibidem, 10 solidi." Mr Tytler in a note says that Culquhanorum is "an obscure word, which occurs nowhere else - conjectured by a learned friend to be 'keepers of the dogs', from the Gaelic root Gillen-au-con - abbreviated, Gillecon, Culquhoun." Sir Robert de Colquhoun, supposed by Mr Fraser, the family historian, to be fifth in descent from the first Humphry, and son of a Humphry, the fourth of Colquhoun, in the reign of David Bruce, married in or previous to the year 1368 the daughter and sole heiress (known in the family tradition as "The Fair Maid of Luss") of Godfry de Luss, lord of Luss, head or chief of an ancient family of that name, and the sixth in a direct male line from Malduin, dean of Lennox, who, in the beginning of the thirteenth century, received from Alwyn, second Earl of Lennox, a charter of the lands of Luss. The Luss territories lie in the mountainous but beautiful and picturesque district on the margin of Loch Lommond, Sir Robert was designed "dominus de Colquhoun and de Luss," in a charter dated in 1368; since which time the family have borne the designation of Colquhoun of Colquhoun and Luss. & Clan MacFarlane. The east bank the home of Clan Buchanan. He is also witness in a charter of the lands of Auchmar by Walter of Faslane, Lord of Lennox, to Walter de Buchanan in 1373. He had four sons, namely - Sir Humphry, his heir; Robert, first of the family of Camstraddan, from whom several other families of the name of Colquhoun in Dumbartonshire are descended; Robert mentioned in the Camstradden charter as "frater junior"; and Patrick who is mentioned in a charter from his brother Sir Humphry to his other brother Robert. The eldest son, Sir Humphry, sixth of Colquhoun, and eighth of Luss, is a witness in three charters by Duncan, Earl of Lennox, in the years 1393, 1394 and 1395. He died in 1406 and left three sons and two daughters. Partick, his youngest son, was ancestor of the Colquhouns of Glennis, from whom the Colquhouns of Barrowfield, Piemont, and others were descended. The second son, John, succeeeded his eldest brother. The eldest son, Sir Robert, died in 1408, and was succeeded by his brother. Sir John Colquhoun was appointed governor of the castle of Dumbarton, by King James I, for his fidelity to that king during his imprisonment in England. From his activity in punishing the depredations of the Highlanders, who often committed great outrages in the low country of Dumbartonshire, he rendered himself obnoxious to them, and a plot was formed for his destruction. He received a civil message from some of their chiefs, desiring a friendly conference, in order to accommodate all their differences. Suspecting no treachery, he went out to meet them but slightly attended, and was immediately attacked by a numerous body of Islanders, under two noted robber-chiefs, Lachlan Maclean and Murdoch Gibson, and slain in Inchmurren, on Loch Lommond, in 1439. By his wife, Jean, daughter of Robert, Lord Erskine, he had a son, Malcolm, a youth of great promise. He died before his father, leaving a son, John, who succeeded his grandfather in 1439. This Sir John Colquhoun was one of the most distinguished men of his age in Scotland, and highly esteemed by King James III, from whom he got a charter in 1457 of the lands of Luss, Colquhoun, and Garscube, in Dumbartonshire, and of the lands of Glyn and Sauchie, in Stirlingshire, incorporating the whole into a free barony, to be called the Barony of Luss; and in the following year he obtained from the king a charter erecting into a free forest the lands of Rossdhu and Glenmachome. From 1465 to 1469 he held the high office of comptroller of the Exchequer, and was subsequently appointed sheriff principle of Dumbartonshire. In 1645 he got a grant of the lands of Kilmardinny, and in 1473 and in 1474, of Roseneath, Strone, &c. In 1474 he was appointed lord high chamberlain of Scotland, and immediately thereafter was nominated one of the ambassadors extraordinary to the Court of England, to negotiate a marriage between the Prince Royal of Scotland and the Princess Cicily, daughter of King Edward IV. By a royal charter dated 17th September 1477, he was constituted governor of the castle of Dumbarton for life. He was killed by a cannon-ball at the seige of Dumbarton Castle, probably in 1478. By his wife, daughter of Thomas, Lord Boyd, he had two sons and one daughter. His second son, Robert, was bred to the church, and was first rector of Argyle from 1473 to 1499. The daughter, Margaret, married Sir William Murray, seventh baron of Tullibardine (ancestor of the Dukes of Athole), and bore to him seventeen sons. His eldest son, Sir Humphry Colquhoun, dies in 1493, and was succeeded by his son, Sir John Colquhoun, who received the honour of knighthood from King James IV, and obtained a charter under the great seal of sundry lands and baronies in Dumbartonshire, dated 4th December 1506. On 11th July 1526 he and Patrick Colquhoun his son received a respite for assisting John, Earl of Lennon, in treasonably besieging, taking, and holding the castle of Dumbarton. He died before 16th August 1536. Byhis first wife, Elizabeth Stewart, daughter of John, Earl of Lennox, Sir John Colquhoun had four sons and four daughters; and by his second wife, Margaret, daughter of William Cunningham of Craigenda, he had two sons and two daughters. His eldest son, Sir Humphry Colquhoun, married Lady Catherine Graham, daughter of William, first Earl of Montrose, and died in 1537. By her he had three sons and two daughters. His son James, designated of Garscube, ancestor of the Colquhouns of Garscube, Adam and Patrick. His eldest son, Sir John Colquhoun, married, first, Christian Erskine, daughter of Robert, Lord Erskine; and secondly, Agnes, daughter of the fourth Lord Boyd, ancestor of the Earls of Kilmarnock. He died in 1575. His eldest son, Humphry, acquired the heritable coronership of the county of Dumbarton, from Robert Graham of Knockdollian, which was ratified and confirmed by a charter under the great seal in 1583. In July 1592, some of the Macgregors and Macfarlanes came down upon the low country of Dumbartonshire, and committed vast ravages, especially upon the territory of the Colquhouns. At the head of his vassals, and accompanied by several of the gentlemen of the neighbourhood, Sir Humphry Colquhoun attacked the invaders, and after a bloody conflict, which was only put an end to at nightfall, he was overpowered by his assailants, and forced to retreat. To quote from Mr Frasers Chiefs of the Colquhouns  "He betook himself to the castle of Bannachra, a stronghold which had been erected by the Colquhouns at the foot of the north side of the hill of Bennibuie, in the parish of Luss. A party of the Macfarlanes and Macgregors pursued him, and laid siege to his castle. One of the servants who attended the knight was of the same surname as himself. He had been tampered with by the assailants of his master, and treacherously made him their victim. The servant, while conducting his master to his room up a winding stair of the castle, made him by preconcert a mark for arrows of the clan who pursued him by throwing the glare of a paper torch upon his person when opposite a loophole. A winged arrow, darted from its string with a steady aim, pierced the unhappy knight to the heart, and he fell dead on the spot. The fatal loophole is still pointed out, but the stair, like its unfortunate lord, has crumbled into dust". Sir Humphry married, first, Lady Jean Cunningham, daughter of John, Lord Hamilton, by whom he had a daughter. Having no make issue, he was succeeded by his younger brother, Alexander. In Sir Alexanders time occurred the raid of Glenfinlas, and the bloody clan conflict of Glenfruin, between the Colquhouns and Macgregors, in December 1602 and February 1603, regarding which the popular accounts are much at variance with the historical facts. The Colquhouns had taken part in the execution of the letters of fire and sword issued by the crown against the Macgregors some years before, and the feud between them had been greatly aggravated by various acts of violence and aggression on both sides. In 1602, the Macgregors made a regular raid on the laird of Lusss lands in Glenfinlas, and carried off a number of sheep and cattle, as well as slew several of the tenants. Alexander Colquhoun, who had before complained to the privy council against Earl of Argyll for not repressing the clan Gregor, but who had failed in obtaining any redress, now adopted a tragic method in order to excite the sympathy of the king. He appeared before his majesty at Stirling, accompanied by a number of females, the relatives of those who had been killed or wounded at Glenfinlas, each carrying the bloody shirt of her killed or wounded relative, to implore his majesty to avenge the wrongs done them. The ruse had the desired effect upon the king, who, from a sensitiveness of constitutional temperament, which made him shudder even at the sight of blood, was extremely susceptible to impressions from scenes of this description , and he immediately granted a commission of lieutenancy to the laird of Luss, investing him the power to repress similar crimes, and to apprehend the perpetrators. "This commission granted to their enemy appears to have roused the lawless rage of the Macgregors, who rose in strong force to defy the laird of Luss; and Glenfruin, with its disasters and sanguinary defeat of the Colquhouns, and its ultimate terrible consequences to the victorious clan themselves, was the result". In the beginning of the year 1603, Allaster Macgregor of Glenstrae, followed by four hundred men chiefly of his own clan, but including also some of the clans Cameron and Anverich, armed with "halberschois, powaixes, twa-handit swordies, bowis and arrowis, andwith hagbutia and pistoletis", advanced into the territory of Luss. Colquhoun, acting under his royal commission, had raised a force which has been stated by some writers as having amounted to 300 horse and 500 foot. This is probably an exaggeration, but even if it is not, the disasters which befell them may be explained from the trap into which they fell, and from the nature of the ground on which they encountered the enemy. This divsted them of all the advantages which they might have derived from superiority of numbers and from their horse. On the 7th February 1603, the Macgregors were in Glenfruin "in two diviions", writes Mr Fraser  "One of them at the head of the glen, and the other in ambuscade near the farm of Strone, at a hollow or ravine called the Crate. The Colquhouns came into Glenfruin from the Luss side, which is opposite Strone  probably byGlen Luss and Glen Mackurn. 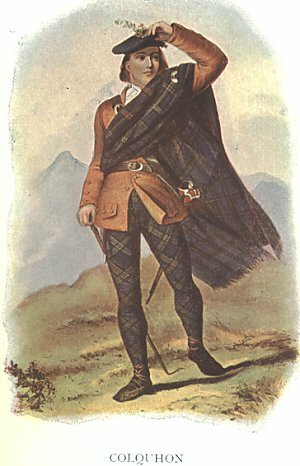 Alexander Colquhoun pushed on his forces in order to get through the glen before encountering the Macgregors; but, aware of his approach, Allaster Macgregor also pushed forward one division of his forces and entered at the head of the glen in time to prevent his enemy from emerging from the upper end of the glen, whilst his brother, John Macgregor, with the division of his clan, which lay in ambuscade, by a detour, took the rear of the Colquhouns, which prevented their retreat down the glen without fighting their way through that section of the Macgregors who had got in their rear. The success of the stratagem by which theColquhouns were thus placed between two fires seems to be the only way of accounting for the terrible slaughter of the Colquhouns and the much less loss of the Macgregors. "The Colquhouns soon became unable to maintain their ground, and, falling into a moss at the farm of Auchingaich, they were thrown into disorder, and made a hasty and disorderly retreat, which proved even more disastrous than the conflict, for they had to force their way through the men led by John Macgregor, whilst they were pressed behind by Allaster, who, reuniting the two divisions of his army, continued the pursuit". All who fell into the hands of the victors were at once put to death, and the chief of the Colquhouns barely escaped with his life after his horse had been killed under him. One hundred and forty of the Colquhouns were slaughtered, and many more were wounded, among whom were several women and children. When the pursuit ended, the work of spoliation and devastation commenced. Large numbers of horses, cattle, sheep, and goats were carried off, and many of the houses and steadings of the tenantry were burned to the ground. Their triumph the Macgregors were not allowed long to enjoy. The government took instant and severe measures against them. A price was put upon the heads of seventy or eighty of them by name, and upon a number of their confederates of other clans:- "Before any judicial inquiry was made", says Mr Fraser, "on 3d April 1603, only two days before James VI left Scotland for England to take possession of the English throne, an Act of Privy Council was passed, by which the name of Gregor or Macgregor was for ever abolished. All of this surname were commanded, under penalty of death, to change it for another; and the same penalty was denounced against those who should give food or shelter to any of the clan. All who had been at the conflict of Glenfruin, and at the spoliation and burning of the lands of the Laird of Luss, were prohibited, under the penalty of death, from carrying any weapon except a pointless knife to eat their meat". Thirty-five of the clan Gregor were executed after trial between the 20th May 1633 and the 2nd March 1604. Amongst these was Allaster Macgregor, who surrendered himself to the Earl of Argyll. By his wife Helen, daughter of Sir George Buchanan of that ilk, Alexander had one son and five daughters. He died in 1617. The eldest son, Sir John, in his fathers lifetime, got a charter under the great seal of the ten pound land of Dunnerbuck, dated 20th February 1602, was created a baronet of Nova Scotia by patent dated last day of August 1625. He married Lady Lillias Graham, daughter of the fourth Earl of Montrose, brother of the great Marquis, by whom he had three sons and three daughters. His two eldest sons succeeded to the baronetcy. From Alexander, the third son, the Colquhouns of Tillyquhoun were descended. Sir John, the second baronet of Luss, married Margaret, daughter and sole heiress of Sir Gideon Baillie of Lochend, in the county of Haddington, and had two sons, and seven daughters. He adhered firmly to the royal cause during all the time of the civil wars, on which account he suffered many hardships, and, in 1654 was by Cromwell fined two thousand pounds sterling. He was succeeded in 1676 by his younger son, Sir James -the elder having predeceased him  third baronet of Luss, who held the estates only four years, and being a minor, unmarried, left no issue. He was succeeded in 1680 byhis uncle, Sir James, who married Penuel, daughter of William Cunningham of Balleichan, in Ireland. He had, with one daughter, two sons, Sir Humphry, fifth baronet, and James. The former was a member of the last Scottish Parliament, and strenuously opposed and voted against every article of the treaty of union. By his wife Margaret, daughter of Sir Patrick Houston of that ilk, baronet, he had an only daughter, Anne Colquhoun, his sole heiress, who, in 1702, married James Grant of Pluscardine, second son of Ludovick Grant of Grant, immediate younger brother of Brigadier Alexander Grant, heir apparent of the said Ludovick. Having no male issue, Sir Humphry, with the design that his daughter and her husband should succeed him in his whole estate and honours, in 1704 resigned his baronetcy into the hands of her majesty Queen Anne, for a new patent to himself in life rent, and his son-in-law and his heirs therein named in fee, but with this express limitation that he and his heirs so succeeding to that estate and title should be obliged to bear the name and arms of Colquhoun of Luss, &c. It was also specially provided that the estates of Grant and Luss should not be conjoined. Sir Humphry died in 1718, and was succeeded in his estate and honours by James Grant, his son-in-law, under the name and designation of Sir James Colquhoun of Luss. He enjoyed that estate and title till the death of his elder brother, Brigadier Alexander Grant, in 1719, when, succeeding to the estate of Colquhoun of Luss, and resumed his own, retaining the baronetcy, it being by the last patent vested in his person. He died in 1747. By the said Anne, his wife, he had a numerous family. His eldest son, Humphry Colquhoun, subsequently Humphry Grant of Grant, died unmarried in 1732. The second son, Ludovick, became Sir Ludovick Grant of Grant, baronet, while the fourth son James succeeded as Sir James Colquhoun of Luss, the third son having died in infancy. He is the amiable and very polite gentleman described by Smollett in his novel of Humphry Clinker, under the name of "Sir George Colquhoun, a colonel in the Dutch service". He married Lady Helen Sutherland, daughter of William Lord Sutherland, son of the Earl of Sutherland, and by her he had three sons and five daughters. In 1777 he founded the town of Helensburgh on the firth of Clyde, and named it after his wife. To put an end to some disputes which had arisen with regard to the destination of the old patent of the Nova Scotia barontcy, (John Colquhoun of Tillyquhoun, as the eldest cadet, having, on the death of his cousin german, Sir Humphry Colquhoun, in 1718, assumed the title as heir male of his grand father, the patentee), Sir James was, in 1786, created a baronet of Great Britain. His second youngest daughter, Margaret, married William Baillie, a lord of session, under the title of Lord Polkemmet, and was the mother of Sir William Baillie, baronet. Sir James died in November 1786. His eldest son, Sir James Colquhoun, second baronet under the new patent, sheriff-depute of Dumbartonshire, was one of the principle clerks of session. By his wife, Mary, daughter and co-heir of James Falconer, Esq. Of Monktown, he had seven sons and four daughters. He died in 1805. His eldest son, Sir James, third baronet, was for some time M.P. for Dumbartonshire. He married, on 13th June 1799, his cousin Janet, daughter of Sir John Sinclair, baronet, and had three sons and two daughters. Of this lady, who died October 21, 1846, and who was distinguished for her piety and benevolence, a memoir exists by the late Rev. James Hamilton, D.D., London. "Some time after Sir James succession". Says Mr Fraser, to whose book on the Colquhouns we have been much indebted in this account, "significant testimony was given that the ancient feud between his family and that of the Macgregors, which had frequently led to such disastrous results to both, had given place to feelings of hearty goodwill and friendship. On an invitation from Sir James and Lady Colquhoun, Sir John Murray Macgregor and Lady Macgregor came on a visit to Rossdhu. The two baronets visited Glenfruin. They were accompanied by lady Colquhoun and Misses Helen and Catherine Colquhoun. After the battlefield had been carefully inspected by the descendents of the combatents, Sir J.M. Macgregor insisted on shaking hands with Sir James Colquhoun and the whole party on the spot where it was supposed that the battle had been hottest. On the occasion of the same visit to Rossdhu, the party ascended Ben Lommond, which dominates so grandly over Loch Lommond. On the summit of this lofty mountain, Sir John M. Macgregor danced a Highland reel with Miss Catherine Colquhoun, afterwards Mrs Millar of Earnoch. Sir John was then fully eightly years of age". His eldest son, Sir James Colquhoun, the fourth baronet of the new creation, and the eight baronet of the old patent, succeeded on his fathers death, 3rd Feb 1836; chief of the Colquhouns of Luss; Lord-lieutenant of Dumbartonshire, and M.P. for that county from 1837 to 1841. He married in June 1843, Jane, daughter of Sir Robert Abercromby of Birkenbog. She died 3rs May 1844, leaving one son James, born in 1844. He, as fifth baronet, succeeded his father, who was drowned in Loch Lommond, December 18, 1873. The family mansion, Ross-dhu, is situated on a beautiful peninsula. To the possessions of the family of Colquhoun was added in 1852 the estate of Ardincaple, purchased from the Duchess Dowager of Argyll. According to Mr Frasr, the three baronets of Luss, before Sir James, purchased up to no less than fourteen lairdships. Robert, a younger son of Sir Robert Colquhoun of that ilk, who married the heiress of Luss, was the first of the Colquhouns of Camstrodden, which estate, with the lands of Achirgahen, he obtained by charter, dated 4th July 1395, from his brother Sir Humphry. Sir James Colquhoun, third baronet, purchased in 1826 that estate from the hereditary proprietor, and re-annexed it to the estate of Luss. The Killermont line, originally of Garscadden, is a scion of the Camstrodden branch. BADGE: Braoileag nan con (arbutus uva ursi) Bear berry. SLOGAN: Cnoc Ealachain (or Cnoc an t-seilich). PIBROCH: Caismeacha Chloinn a’ Chompaich. IF the battle of Glenfruin remains the most outstanding, triumphant, and disastrous landmark in the history of Clan Gregor, it remains also the most notable in that of their old enemies, the Colquhouns. Every day, all summer through, a great stream of tourists makes its way up the silver reaches of Loch Lomond, and strangely enough the two interests which most engross the attention of the pilgrims are the associations with Rob Roy on the eastern shore of the loch and the memories of the great battle which the Colquhouns fought with the MacGregors in Glenfruin on the western side. This wide "Glen of Sorrow," as its name means, opens away among the hills some three miles above Balloch, at the southern end of the loch, and, while its "water" has become famous among anglers within recent years, the interest of the glen to most passers-by must remain for all time that of the great clan conflict in which the Colquhouns suffered so severely at the hands of their invading enemies. Roderich vich Alpin dhu, Ho ieroe! The ultimate result of the battle was very different from what might have been expected. While the MacGregors were hunted and harried through all their fastnesses, the Colquhouns quietly settled again on their lovely loch shore, and their subsequent fortunes illustrated well the old saying, "Happy is the nation that has no history." From the foot of Glenfruin to the head of Loch Lomond, and over the hills along the whole side of the Gareloch and Loch Long to Arrochar, stretch the fair mountain possessions of the Chiefs of Colquhoun at the present hour. On Gareloch side the fair garden city of Helensburgh has risen on their estate; and their possessions include not only their ancient lands of the time of the battle of Glenfruin, but also the territories of the Macaulays at Ardencaple, and of the wild MacFarlanes at Arrochar. There is no lovelier avenue in the Highlands than that from the south gateway below Glenfruin, which winds along the silvan shores of the loch for a mile and a half, to Rossdhu, and thence for another mile northwards on the road to Luss. Rossdhu itself stands, a stately seat, on its promontory, with deer park and noble woods about it; and the Colquhoun village of Luss, at the foot of its own beautiful glen, remains, in spite of the streams of tourists who pass it by in steamers and motor cars, one of the most sequestered and unspoiled spots in all the Highlands. Curiously enough the original seat of the family was not on Loch Lomond side at all. Dunglass Castle, just below Bowling on the opening Firth of Clyde, at the spot where the old Roman Wall is believed to have had its western end, was the early seat of the race, and the three-mile stretch down the western shore of the Firth thence to Dunbarton rock formed the old barony of Colquhoun from which the family took its name. Some five centuries ago, however, the laird of Colquhoun married the heiress of the older lairds of Luss, and thus by and by the headquarters of the family were removed to Loch Lomond side. Here the heads of the house seem to have steadily increased in prosperity, and the followers of their name to have grown in numbers. For the most part they appear to have been a peaceful race, and it was not until towards the end of the sixteenth century that they began to be mixed up in the distressful business of the making of history. Sir Humphrey Colquhoun, the chief of that time, in 1582 purchased the heritable crownership or coronership of Dunbartonshire, to be held blench of the Crown for the annual fee of one penny; and it was this Sir Humphrey who, ten years later, first came into conflict with Clan Gregor. In face of an assault by the MacGregor clansmen from the other side of the loch, he was forced to take refuge in his strong castle of Bannochra, of which the ruin is still to be seen in Glenfruin, and here, it is said, he fell a victim to the treachery of his servant. This man, in lighting the chief up the stair at night, so managed his torch as to throw the light upon his master, and make him a mark for the arrow of an enemy outside, by whom Sir Humphrey was shot at and slain. The story goes that the death of the chief was brought about by his second brother, John. At any rate an entry in the diary of Robert Birrell, burgess of Edinburgh, dated 30th November, 1592, mentions that "John Cachoune was beheidit at the Crosse at Edinburghe for murthering of his auen brother the Lairde of Lusse." Further confirmation of the tradition that John was the guilty man is to be found in the fact that Sir Humphrey was succeeded, not by his second but by his third brother, Sir Alexander Colquhoun. This chief, Sir Alexander, was the man who figures in the great contest with the MacGregors at Glenfruin. In his introduction to Rob Roy Sir Walter Scott lays the blame of beginning the feud upon the Colquhouns. His narrative runs, "Two of the MacGregors, being benighted, asked shelter in a house belonging to a dependent of the Colquhouns, and were refused. They then retired to an outhouse, took a wedder from the fold, killed it, and supped off the carcase, for which they offered payment to the owner. The Laird of Luss, however, unwilling to be propitiated by the offer made to his tenant, seized the offenders, and by the summmary process which feudal barons had at their command, caused them to be condemned and executed." Sir Walter adds that "the MacGregors verified this account of the feud by appealing to the proverb current among them, execrating the hour when the black wedder with the white tail was ever lambed." There is at the same time another and probably a truer account of the outbreak of the trouble. It would appear that the MacGregors were instigated to attack the Coiquhouns by Archibald, Earl of Argyll, who had his own ends to serve by bringing trouble on both clans. As a result of the constant raids by the MacGregors, thus brought about, Sir Alexander Colquhoun in 1602 obtained a licence from James VI. to arm his clan. On the 7th of the following February the two clans, each some three hundred strong, came face to face in battle array in Glenfruin. The battle was so much a set affair that Alastair MacGregor divided his force into two parties, he himself attacking the Colquhouns in front, while his brother John came upon them in the rear. The Colquhouns defended themselves bravely, killing among others this John MacGregor; but, assailed on two sides, they were at last forced to give way. They were pursued to the gates of Rossdhu itself, and 140 of them were slain, including several near kinsmen of the chief and a number of burgesses of Dunbarton who had taken arms in his cause. According to a well-known tradition, some forty students and other Dunbarton folk had come up to witness the battle. As a watch and guard MacGregor had set one of his clansmen, Dugald Ciar Mhor, over these spectators. On the Colquhouns being overthrown, MacGregor noticed Dugald join in the pursuit, and asked him what he had done with the young men, whereupon the clansman held up his bloody dirk, and answered, "Ask that!" The MacGregors followed up the defeat of the Colquhouns by plundering and destroying the whole estate. They drove off 600 cattle, 800 sheep and goats, and 14 score horses, and burned every house and barnyard and destroyed the "Haill plenishing, guids, and gear of the four-score pound land of Luss," while the unfortunate chief, Sir Alexander Colquhoun, looked on helpless from within the walls of the old castle of Rossdhu, the ruin of which still stands on its rising ground behind the modern mansion. Retribution, swift and terrible, however, was visited upon the MacGregors. Some sixty Colquhoun widows in deep mourning, carrying their husbands’ bloody shirts on poles, appeared before James VI. at Stirling. It has been suggested that this parade was not all genuine, that these women were not all widows, and that the blood on the shirts had not been shed in Glenfruin. But the King was sufficiently moved, and forthwith letters of fire and sword were granted against the MacGregors. Their very name was proscribed and the sheltering of one of the clan was made a crime punishable with death. While his men were hunted with dogs along the hills, the chief, Alastair Gregor, was induced across the Border by the promise of his false friend, Argyll. The latter had given his word that he would see him safely into England, whither the King had by that time removed his court; but no sooner was MacGregor across the Border than Argyll had him arrested and carried back to Edinburgh, where on 20th January, with four of his henchmen, he was tried, condemned, and hanged at the Cross, while all his possessions were declared forfeited. A few years later a drama of another kind was carried out at Rossdhu. The son of the chief who fought at Glenfruin was made a baronet. Sir John Colquhoun married Lilias Graham, eldest sister of the great Marquess of Montrose, and he returned the King’s favour by proving a devoted loyalist in the Civil War, for which action he was fined £2,000 by Oliver Cromwell. Besides this, Sir John had another trouble in hand. He appears to have run away with a younger sister of the Marquess of Montrose, Lady Catherine Graham, who had taken refuge at Rossdhu. He was accused of having used the Black Art for the purpose of enticing her, and of having employed, among other witches and sorcerers, one Thomas Carlippis, whom he kept as his ordinary servant. Along with certain love philters, he is said to have used a certain jewel of gold set with divers diamonds, rubies, and other precious stones, and from this fact one may doubt whether there was much necromancy after all in the attractions with which he overcome the scruples of the fair young lady. As a consequence, however, the gay baronet was outlawed and excommunicated, and, what with the expense of his love-jewels, his fines as a Royalist, and other extravagances, he was presently forced to dispose of his life-rent of the estates, and it was only with difficulty that possession was recovered by the bargaining of his shrewd brother, Humphrey Colquhoun. The male line of the Colquhouns came to an end with Sir John’s grandson, Sir Humphrey. This laird was a member of the last Scottish Parliament and an ardent opponent of the Union with England. He had an only daughter, Anne, who was married to James Grant of Pluscardine, second son of the Chief of the Grants. He was most anxious that his daughter should inherit his honours and estates, instead of his nephew, John Colquhoun of Tillie.Colquhoun, now Tilliechewan, near Balloch. To secure this he resigned his baronetcy and estates into the hands of the King, and in 1704 received a new charter securing the life-rent of these possessions to himself and entailing them afterwards upon his daughter and son-in-law. Then, in order that the name and estate of Colquhoun should at no time become merged with those of the Grants, he provided that if at any time the Laird of Colquhoun should succeed to the lairdship of Grant, the Coiquhoun estate should at once pass to the next Colquhoun heir. Curiously enough, Sir Humphrey was not long dead when his daughter’s husband succeeded his elder brother as Laird of Grant. Thereupon the Colquhoun estates passed to Anne’s second son, Ludovic Grant, who forthwith took the name and designation of Sir Ludovic Colquhoun. By and by, however, Sir Ludovic’s elder brother died, and he himself became Laird of Grant, and had to resign the Luss estates to his younger brother, the third son of Anne Colquhoun. Then came a curious incident. A poacher was charged at Dunbarton Sheriff Court with trespass on the lands of Sir James Colquhoun, Bail., of Colquhoun and Luss. The lawyer who defended him pleaded that the indictment was irrelevant, as the accuser was not Sir James Colquhoun, Bart., and he won his case. The fact was that in arranging for the succession to the estates, Sir Humphrey Colquhoun had failed to provide for the simultaneous succession to the baronetcy, which now really belonged to the descendant of his nephew, John of Tillie-Colquhoun. The Laird of Luss, however, was made a baronet of Great Britain in 1786, and by the failure of the line of Tillie-Colquhoun, the original baronetcy afterwards returned to his descendant. In more recent days the Lairds of Luss have played a not less distinguished part in Scottish affairs. They have been members of Parliament and Lords Lieutenant; one was a Principal Clerk of the Court of Session, and another a Sheriff Depute of Dunbartonshire, while one member of the family, John Colquhoun, was author of the well-known open-air book, The Moor and the Loch, and his daughter, Mrs. L. B. Walford, is one of the best-known novelists of our time. In 1847, when Queen Victoria visited Dunbarton Castle, she was received by Sir James Colquhoun as Lord Lieutenant. The carriage in which he drove her Majesty from and to the landing-place is still kept in the coach-house at Rossdhu, and a picture representing Sir James in the act of receiving her Majesty still hangs in the hall. Alas! this same Sir James, twenty-six years later, came to his end in a way which is recalled yet as one of the most tragic of Loch Lomond’s memories. On the 18th of December, 1873, with five of his keepers he had gone to the Colquhoun deer island of Inch Lonaig to secure Christmas fare for his tenants and friends. On his return in the heavily-loaded boat he had reached Inch Tavanach, the "Monk’s Island," off Luss, when, in a sudden storm the boat was swamped and all on board perished. Sir lain Colquhoun, the present possessor of the estates and holder of the title, is the third successor since then. Before the war he held a commission in the Scots Guards, and was a noted athlete, winning the light-weight boxing championship of the British army. On the outbreak of war in 1914 he went to the front in France, where he greatly distinguished himself, won the D.S.O. with bar, was mentioned in dispatches and held the rank of Major. He is now Lord-Lieutenant of Dunbartonshire. Septs of Clan Colquhoun: Cowan, Kilpatrick, Kirkpatrick, Macachounich, MacCowan.